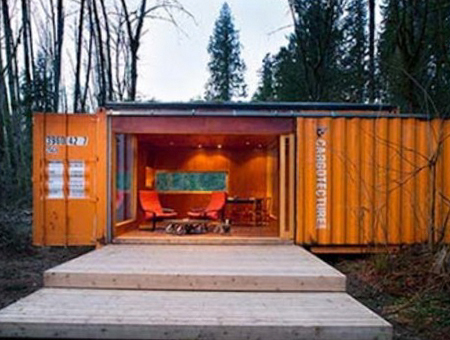 "It's the best design Cargotecture has ever done. With code setbacks, it houses 264 people per acre or (22) c900 Bunkhouses." 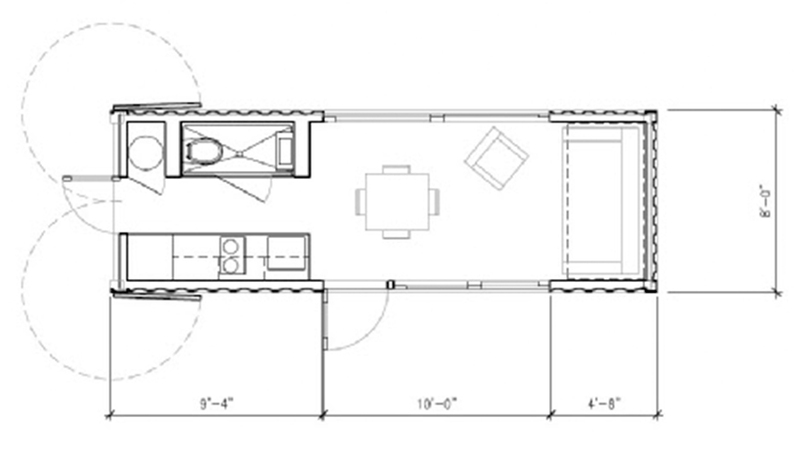 There is no less expensive way to house a large number of people than the c900 Bunkhouse. 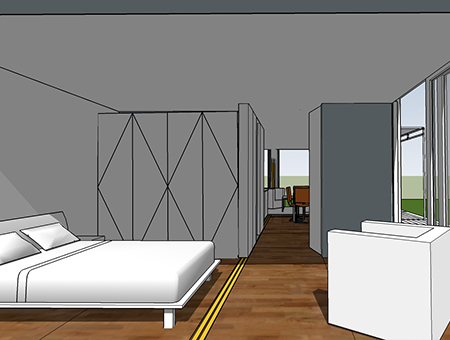 The design inspiration is “luxury cruise ship bunkhouse” in a transformation of inexpensive lightly stained plywood. 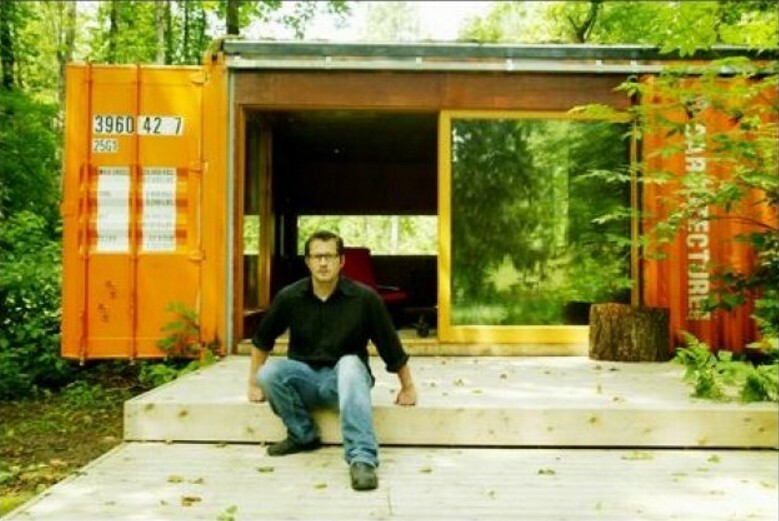 what can you do with a steel shipping container? 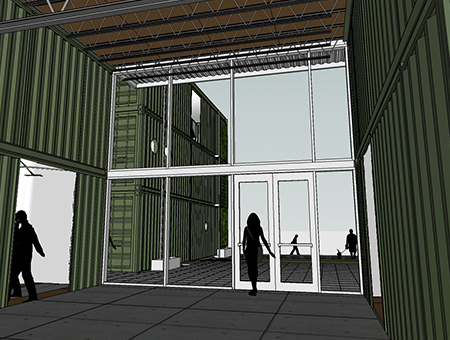 Intermodal Shipping Container design marries environmental sustainability with cutting-edge design sensibility. 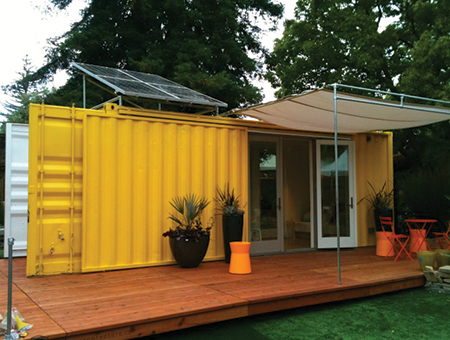 Cargotecture has a well-earned reputation as one of the world’s preeminent shipping container design firms. Led by renowned designer Joel Egan, we have created functional space for a variety of uses for municipalities, homeowners and developers for over 14 years. If you come, we will build it. Think inside the box… what can you do with a steel shipping container? 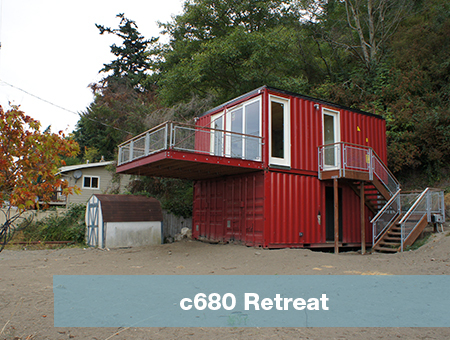 This retreat is a (somewhat) famous cargo container house project which has been featured on several television programs, including HGTV’s “Small Space, Big Style” and “Some Assembly Required.” It is situated on the wooded edge of a big farm outside of Seattle. The owner uses this completely off-the-grid modern cabin to get away from the bustle of farm activity, as well as for guests. 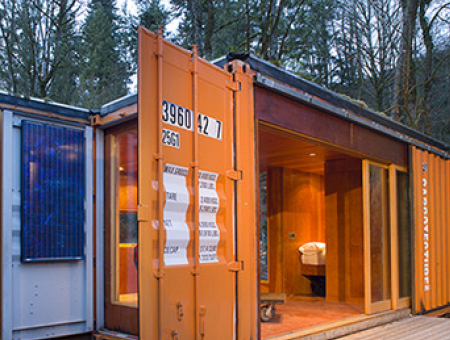 Many sustainable concepts have been integrated into this container home, including using recycled containers, decking milled from wind-felled trees, and recycled steel in the foundation. 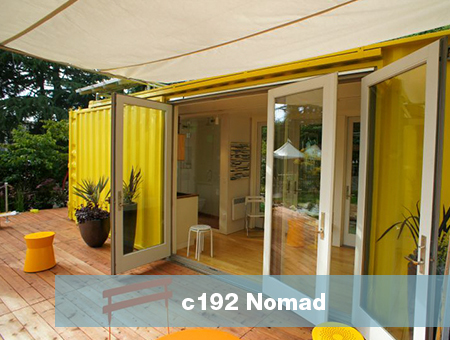 Sunset Magazine, a lifestyle magazine focusing on the Western US, featured a c192 Nomad as their Idea House, the first and only shipping container home to win that award. With rooftop solar power for all its needs, this bright yellow Nomad has a small carbon footprint yet makes a powerful visual statement. 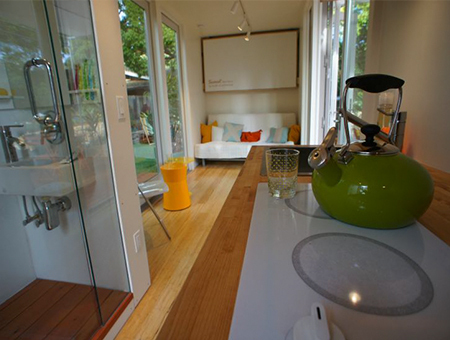 Sleek Duravit fixtures and bamboo floors make for a stylish getaway that sleeps four comfortably. 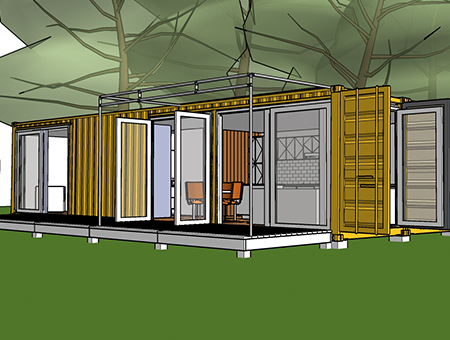 Transportable and sustainable, it is a true Cargotecture original. This two-story Cargotecture retreat is on an island outside Seattle. This wonderful cargo container house looks out across its beach to the shipping lanes to and from Asia, where many shipping containers can be seen passing each day. The context is fantastic. 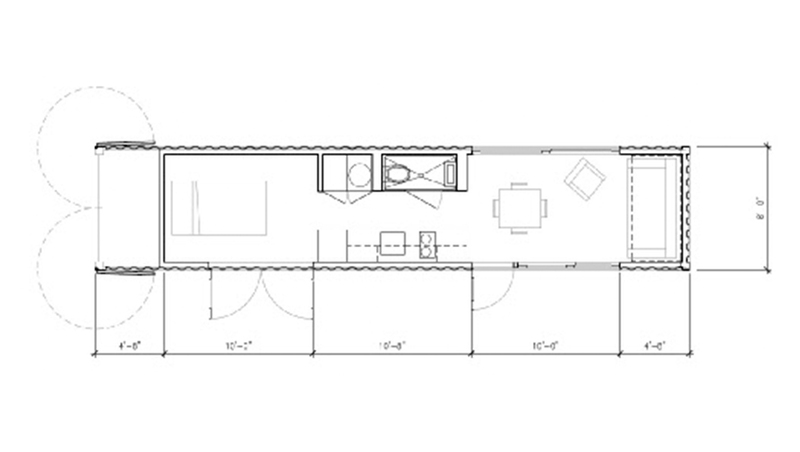 Designed to handle high winds and storms, this container home also features a large deck, a beautiful stylish interior and access to the slope behind it. 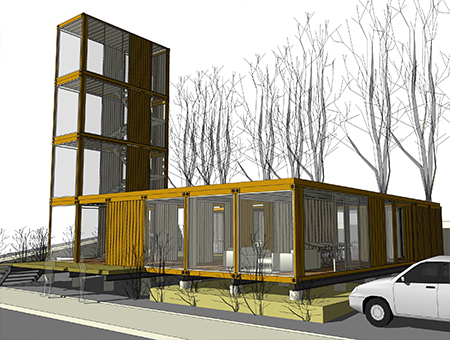 This is Cargotecture’s very first project from way back in 2003. 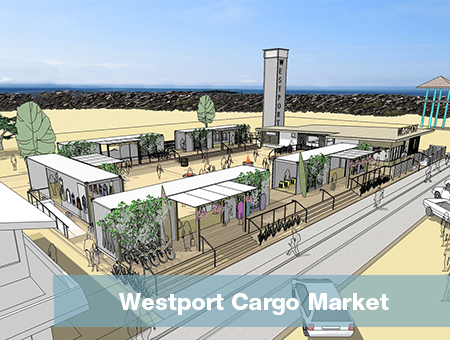 We envisioned “Cargotown” as a live-work light industrial market/neighborhood development at the south end of Seattle’s waterfront, on the site of a former cargo terminal. 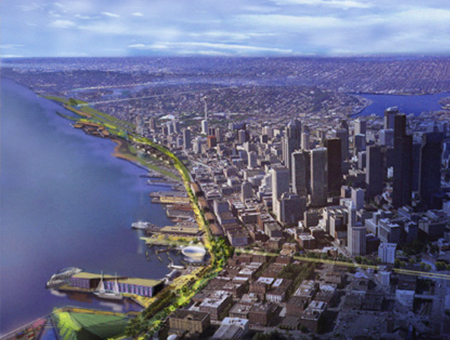 Our firm presented it to the City of Seattle and the civic organization Allied Arts. 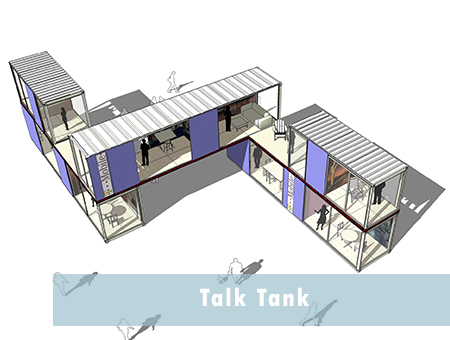 No other American firm was doing container architecture in 2003. We were the first. 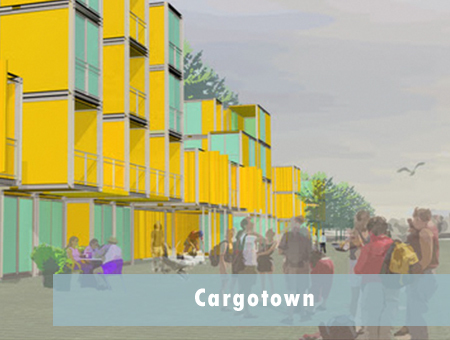 There would be no “Cargotown” without “Cargotecture,” and we believe this still may get built. 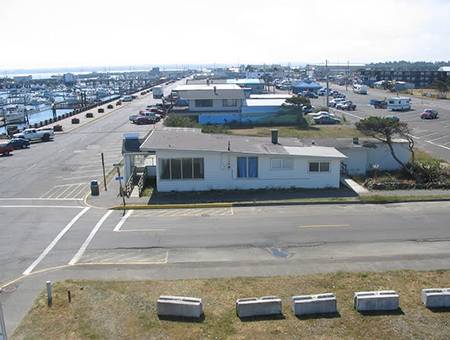 One of Cargotecture’s most ambitious and forward-looking designs is for an entire new “village” on what is currently a windswept area popular with surfers, in coastal Westport, Washington. 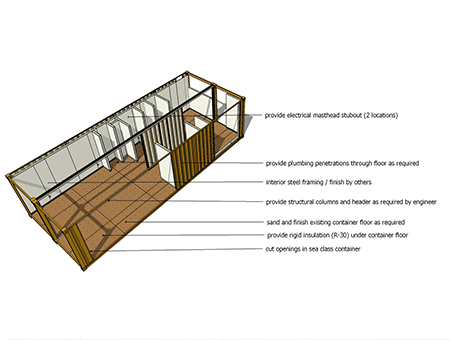 The vision is of a vibrant, sustainable space made up of containers in a variety of styles built around a classic legacy roadhouse restaurant/pizzeria that gives the whole project a historical context. 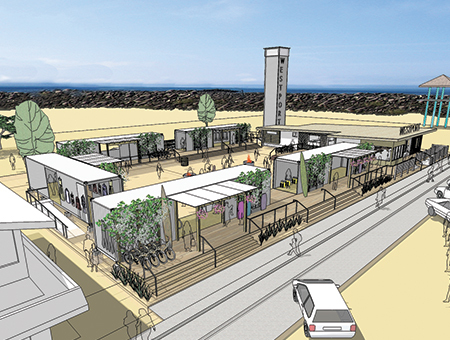 The containers create a central space reminiscent of traditional urban market areas, while the container-tower reflects contextually as a lighthouse, with a beacon that can be seen for miles over the waves. 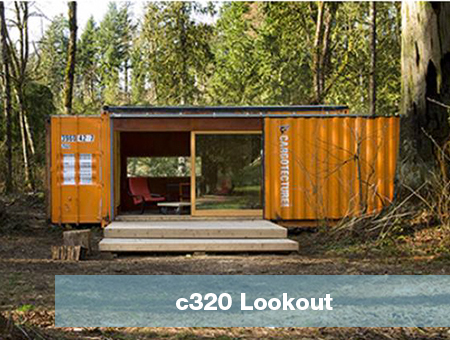 The c640 Lookout is a 640sf double-wide pair of 40’ containers configured as a 1.5 bedroom, one bathroom home. 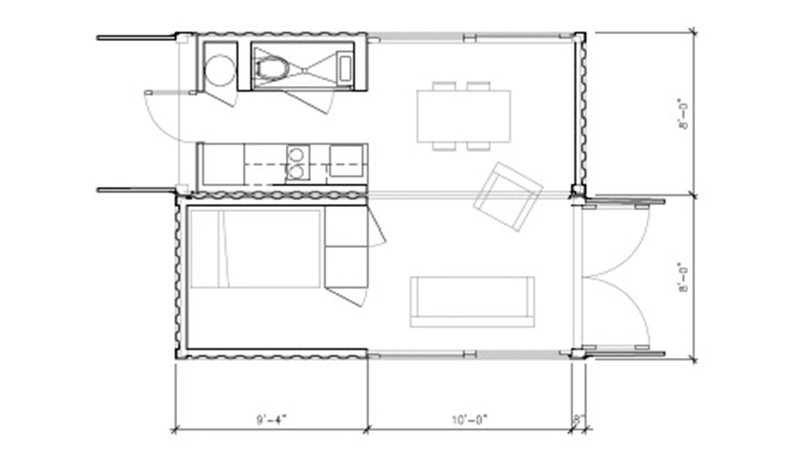 It comes complete with washer/dryer, kitchen with appliances and a cedar accent wall, choice of gas or electric heat, windows, insulation, light fixtures, plumbing fixtures- it is plug-and-play from the factory and is a very affordable complete home ready for move-in within days of installation. 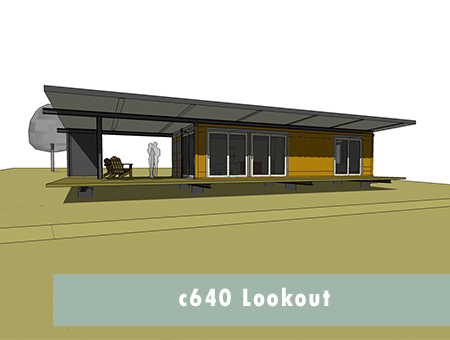 The pictured c640 Lookout project is on the boards for a site in central Washington State and will be delivered by the factory later this year. 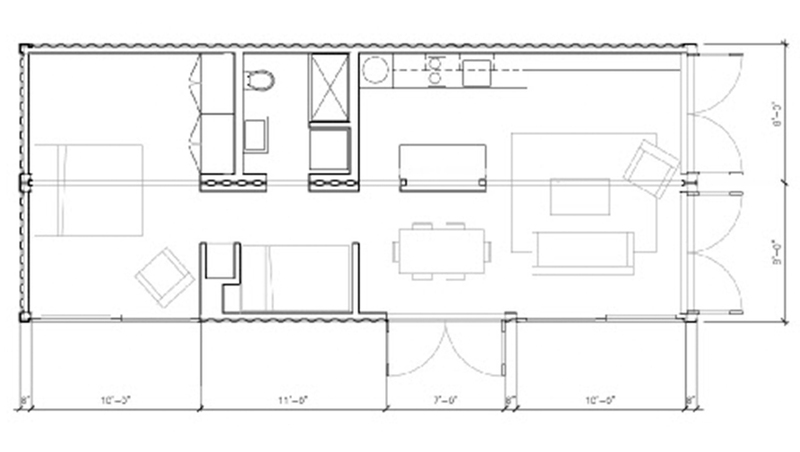 A bunk bed option allows the home to host two more adults, and there is generous storage throughout, making it an excellent retreat for a second home site or as a guest cabin. 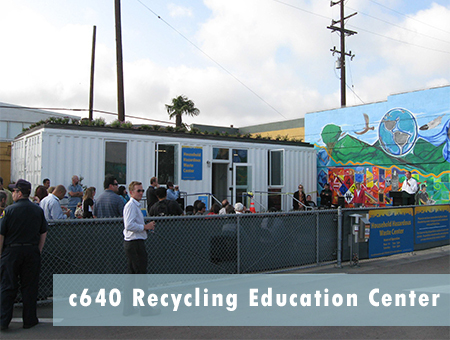 This wonderful and successful project was designed for Santa Monica, California in 2012 to help its citizens understand more about the recycling process. The building hosts school groups learning about environmental responsibility. 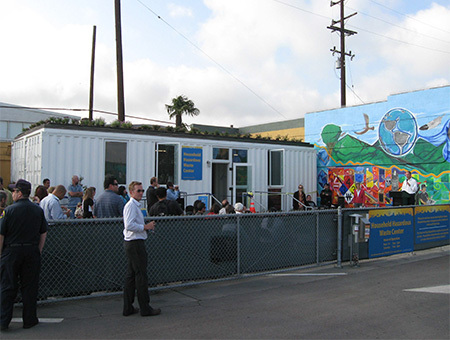 A LEED Platinum project, the two-40-foot containers feature a “Green Roof”, ceramic heat-resistant white paint, and sustainable windows and doors. 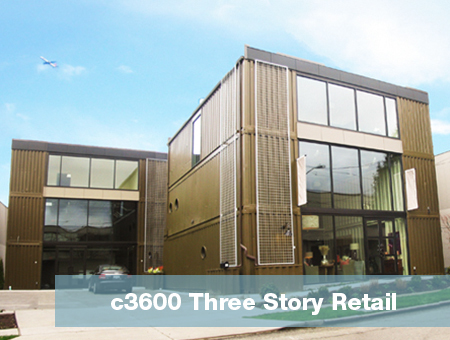 This landmark structure was and is Seattle’s first cargo container -based commercial building, and generated extensive media coverage at the time. Erected in 2009 in the aftermath of the Great Recession, it represents a 20-40% reduction in construction costs compared to typical commercial construction. 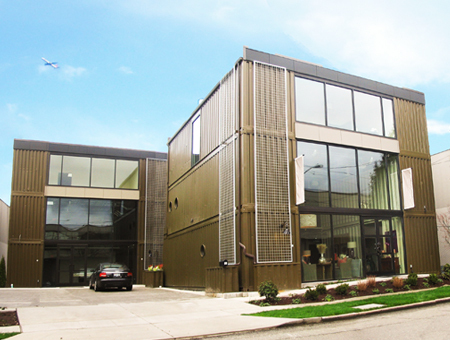 Constructed from 12 shipping containers, it houses a double-height retail showroom gallery and 7.200 square feet of total space on the 7,000 square foot lot. It features a Green Roof, sustainable landscaping, and recycled materials for reduced environmental impact. 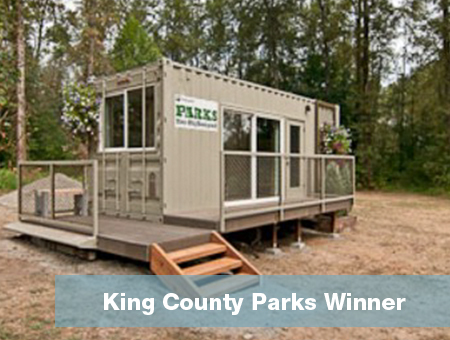 A few years back our firm won the competition for a cargo container cabin at King County (Seattle) Parks Department. 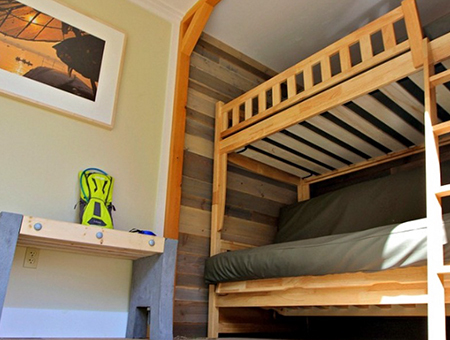 This beautiful design hosts couples and kids in bunk beds and is overinsulated. 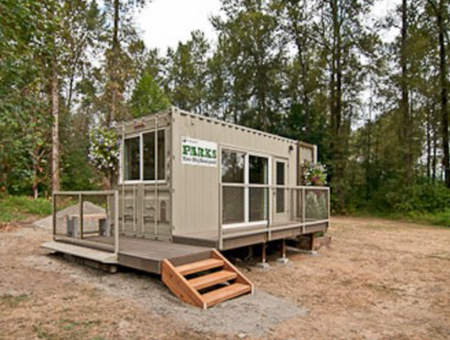 These features make it extremely popular for guests in Fall & Winter at the campground. 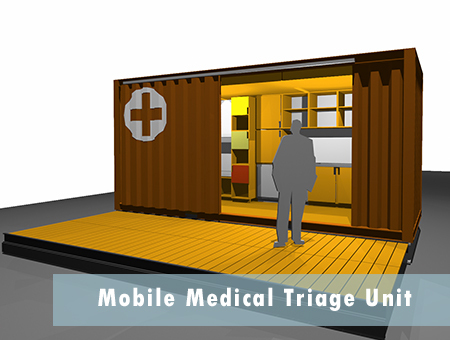 We designed this transportable Mobile Medical Triage Unit for the Nobel-Prize winning NGO Doctors Without Borders (Medecins Sans Frontieres) in 2004. Built from one 8 by 20 container, it nonetheless can store a wide range of supplies and handle a good deal of emergency clinic traffic. Several different versions have now been built around the world. This project was designed to be the site of a type of reality-show contest for a cell phone provider, and was to be situated in Washington Square Park in Manhattan, NYC. The concept of the promotion was that contestants would try to stay on the telephone for the longest period of time, and they would be visible throughout their calling. So we created a fishbowl concept, making the entire building see-through with walls of windows. Though seemingly futuristic and cutting-edge, it actually would be relatively easy to construct and site. This on-the-boards project is garnering great anticipation from both the community and our clients here in Seattle, Washington. The tower in the project will overlook the condominium (under construction), and also will boast a spectacular view of beautiful Lake Union, too. 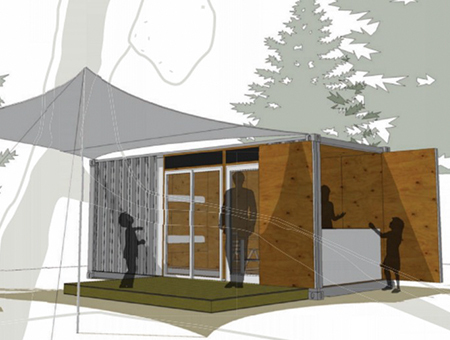 Every element of this project is relocatable and sustainable. 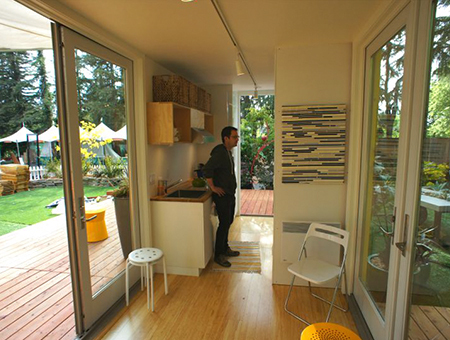 This is a backyard home office in the Fremont District of Portland, Oregon. The owners are very happy with their new 384 square foot office, built in 2010. 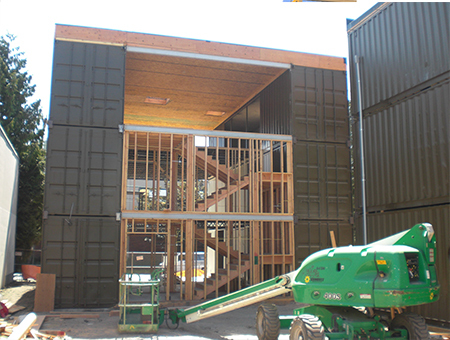 It is made of two 24-foot containers, and features a “Green Roof” which increases insulation, improves the habitat, and reduces energy usage. 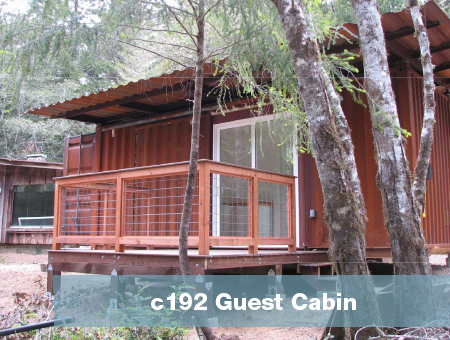 A guest cabin was needed adjacent to an existing stick-built cabin at a site 4 hours north of San Francisco. 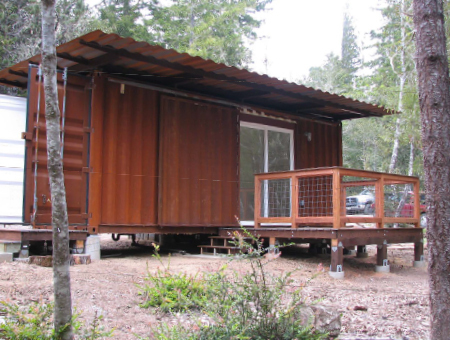 This great-looking steel container guest cabin was sandblasted to reveal the brown Corten weathering steel behind the paint. Corten steel has about 5% nickel in it, which means that when it rusts 1/32”, it will then rust no further, yielding a fantastic look. That is why cargo containers, and indeed all sea-going ships, are all built from Corten weathering steel. This cabin also has a projected roof which sheds water from areas around it, which is available as an option for most models. 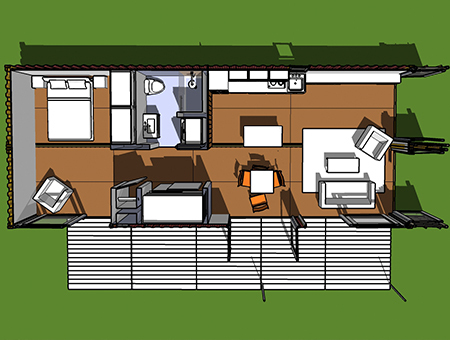 The client is very happy with this cargo container home. This multi-use project was designed to Innovatively maximize the square footage and drama on a pocket-sized lot on Seattle’s Capitol Hill. 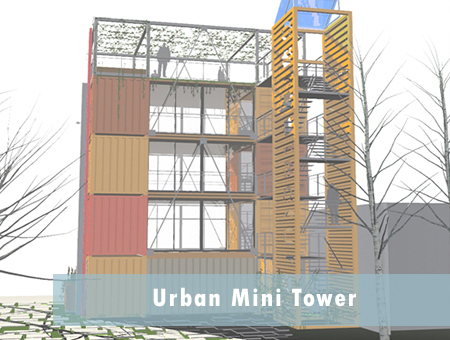 The building houses two 640 square foot apartments over a double-height commercial space, and the standing stairwell tower is constructed from an uprighted cargo container. Green water collection and native vines are included from the ground level all the way up to the roof deck. 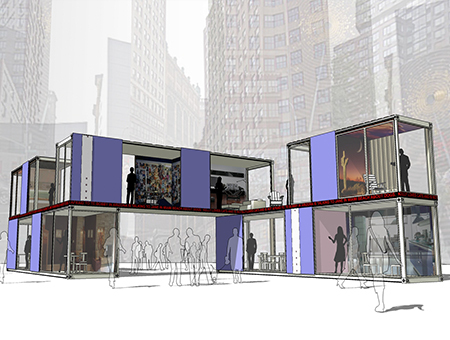 This dramatic unbuilt cargo container building project has the ability to transform urban landscapes. 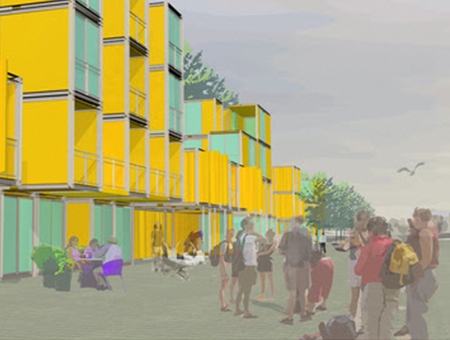 It can be entirely factory-built and transported to the eventual site, allowing to form the basis for a new way of developing new or reclaimed neighborhoods with modern, attractive, durable and affordable structures that reflect the way urban dwellers want to love today – sustainable, low carbon footprint, and oriented to the rhythms of the street. This striking building was custom-designed to be a public facility for the community of Scottsdale, Arizona. Fashioned from one 8-by-20-foot container, it reflects the regional feel of the pueblo with its soaring wing of an awning. It can be customized for many different portable or permanent restroom requirements. 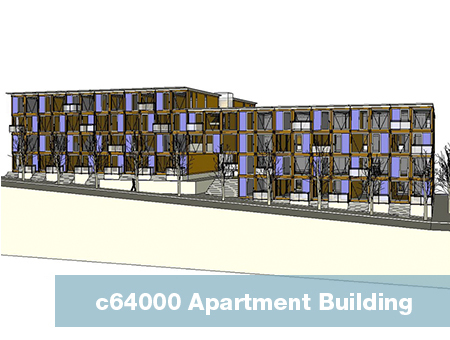 This 64,000sf, four story 100-unit apartment design was designed for a Seattle property next to some cargo container railyards, and is still on the boards The context will be fantastic. 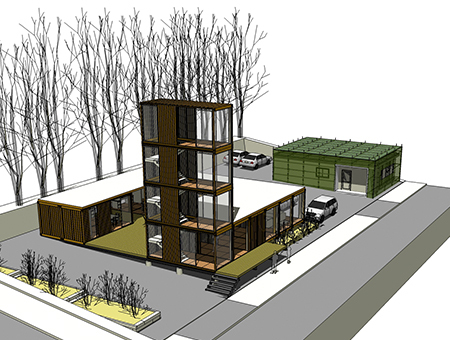 It is modern, highly efficient, and strong and resilient enough to be approved in a seismic zone even with four stories. 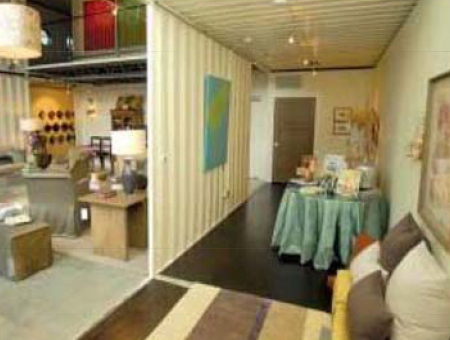 True to its heritage, it features cargo container floors and walls exposed on the inside. 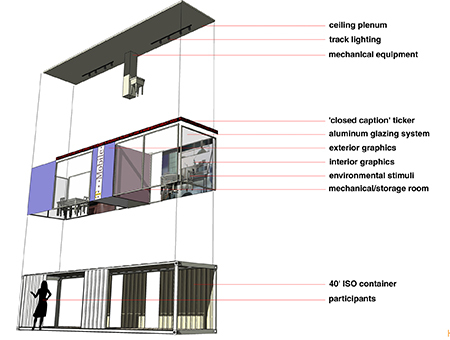 The entire structure can be built in a factory and craned into place in one single day. 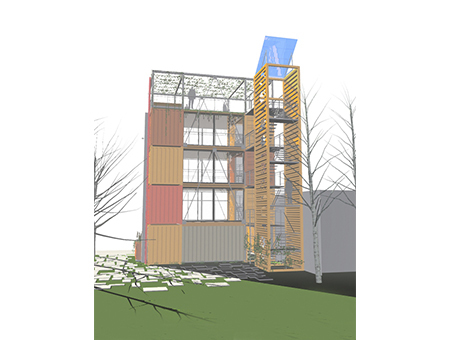 We hope to bring this monumental cargo container building to Seattle’s Interbay Neighborhood soon. Joel Egan is a Seattle native who received his BS in Experiential Psychology in 1994 from Western Washington University. His study of the effects of the five human senses led to his deep understanding of function and form and the human experience of the built structure. 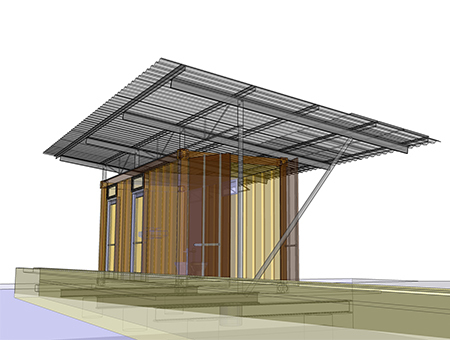 Living in Winthrop, Washington, high in the Cascades, Joel mastered residential design and construction in extreme hot/cold weather environments. 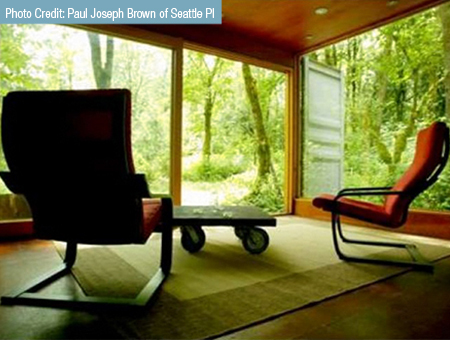 He earned his Masters in Architecture from the University of Oregon in 2000, with an emphasis on sustainability. During school he lived and worked in France, Italy, and Japan. 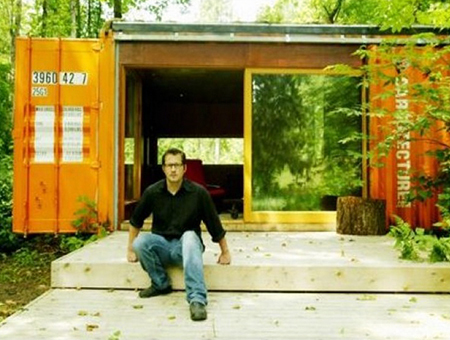 Joel founded Cargotecture in 2003, and practices in Seattle, Washington. The firm has past and ongoing work in the Pacific Northwest, Texas, California, Vermont, New York, Nevada, Utah, and Florida. The practice can support projects around the world. 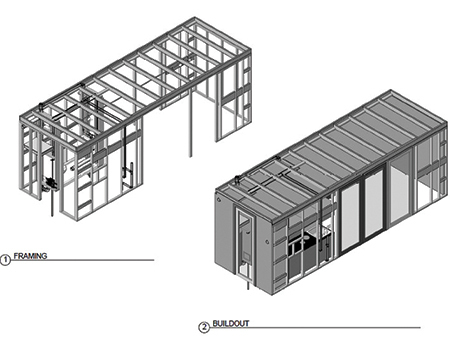 Cargotecture can provide services ranging from schematic design, design development, consultancy, and project management for any global project. 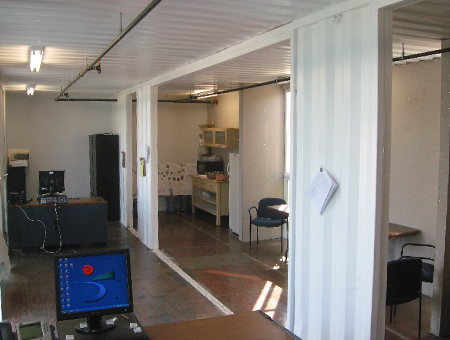 Cargotecture creates both site-built and factory-built designs and completed projects. 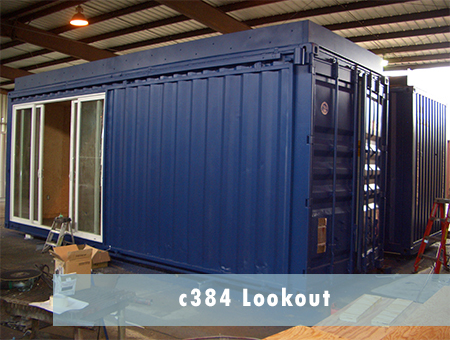 Cargotecture also provides permitting services for projects in most jurisdictions. 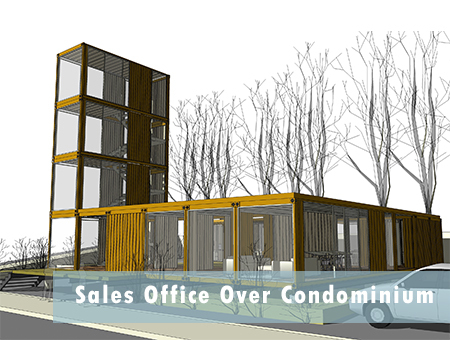 Cargotecture gets its name from the practice of creating buildings out of steel intermodal shipping containers, which it helped to pioneer. This has now become a trend featured in architectural and style journals worldwide. 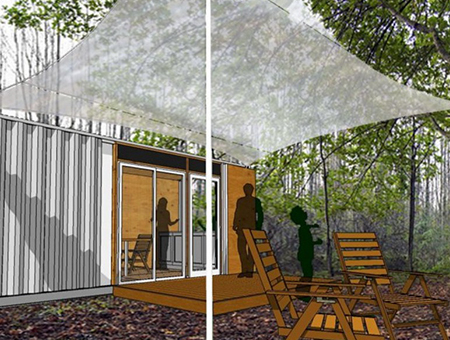 This method merges Egan’s focus on sustainability with his understanding of the interplay of senses and structure. 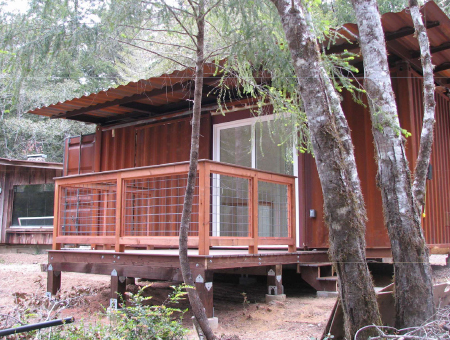 Why do you build structures from steel shipping containers? 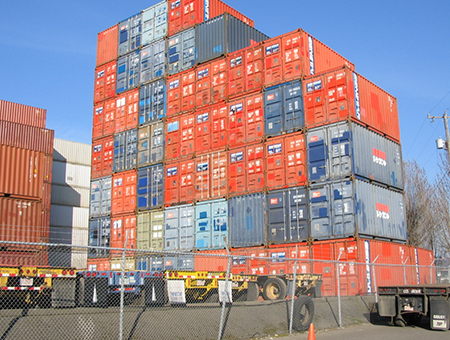 The steel intermodal-shipping container (ISC) was designed to simplify and streamline long-distance shipping in the era after World War Two, and there are millions of these containers in existence, with many out of use. 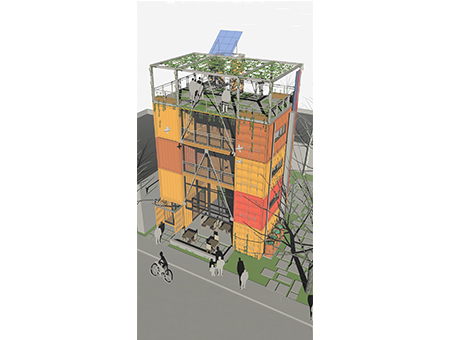 In recent years, architects and builders have come to recognize that these versatile strong platforms represent a way to unite environmental concern with structural integrity. 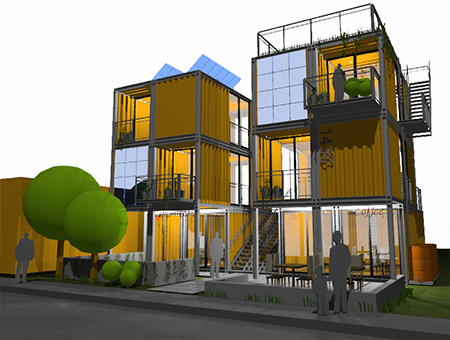 Disused containers can be sustainably recycled into real estate, eliminating waste. Cargotecture was founded to manifest this promise. 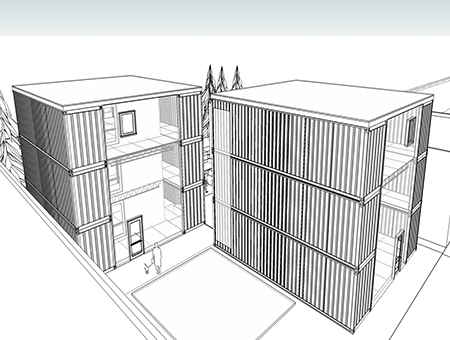 Is cargo/shipping/intermodal container architecture appropriate for affordable housing? The best answer is “Maybe.” Affordability is a flexible concept, depending greatly on regional and local real estate valuations and trends. For example, in the Upper Midwest, where a Victorian can be obtained for less than $100,000, including land, it would be difficult to produce an ISC-based home with as much space for that cost. 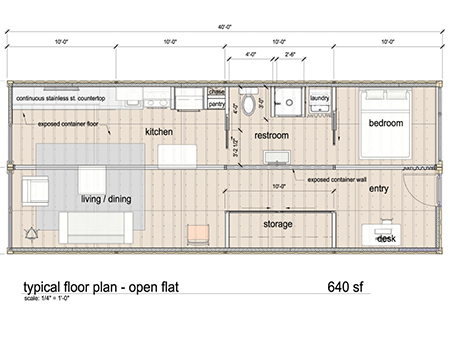 On the other hand, in markets where real estate is dear and zoning makes land expensive, ISC homes can be a viable alternative to stick-built, especially in jurisdictions that specifically allow for microhousing. In places such as the Pacific Northwest, Silicon Valley, and the Northeast, prices are high and zoning is tight, so new construction is both rare and expensive. If one can add a two-bedroom home to an existing property in the San Francisco area for less than $200,000, this represents a significant savings of as much as 90% from the existing market rate. 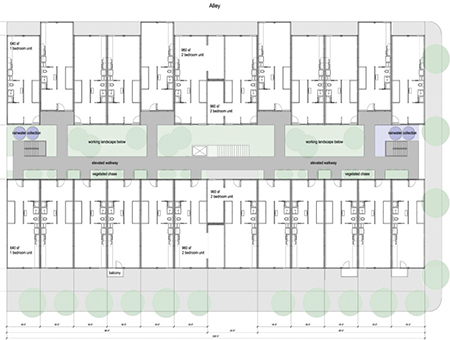 Groupings of such homes could represent a very viable rental investment. In such areas, steel shipping container homes can become a bridge to homeownership for young people, and can assist municipalities experiencing housing shortages. In such regions, ISC homes are a viable affordable housing concept. 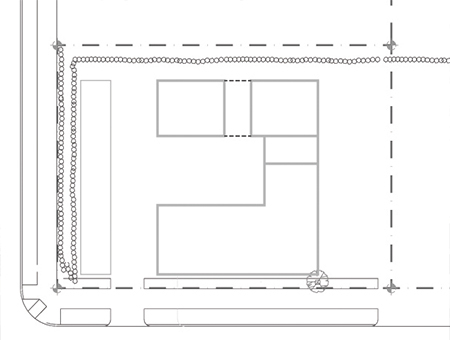 What should I know about zoning? 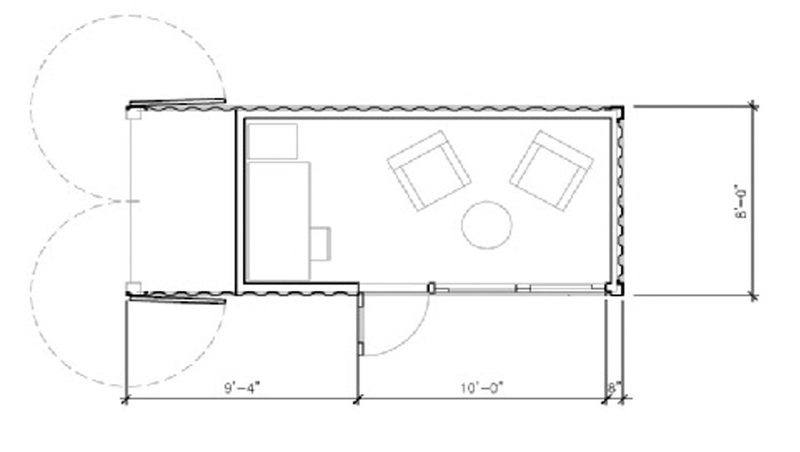 Even if your area does not allow microhousing, it may be possible to add an ISC building to your current property, or to get an ISC home approved on developable vacant land. Cargotecture recommends that our potential customers begin the investigative process with the relevant municipal zoning and planning departments before truly contemplating a purchase. In many jurisdictions, if your project is less than 200sf there is no permitting process required. Are there barriers to ISC home construction? There are several elements that can increase the cost of an ISC-based building. 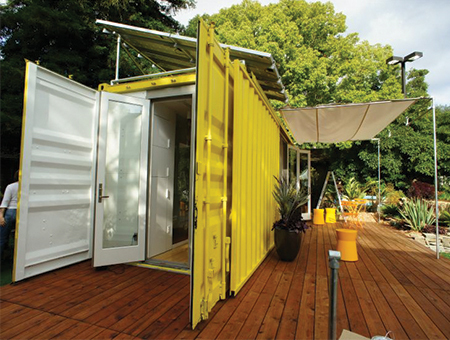 • Container-based construction does not reduce the cost of permit-required components inside. • Micro-home appliances are less common and micro-sized, making them more expensive than appliances found in stick-built construction. 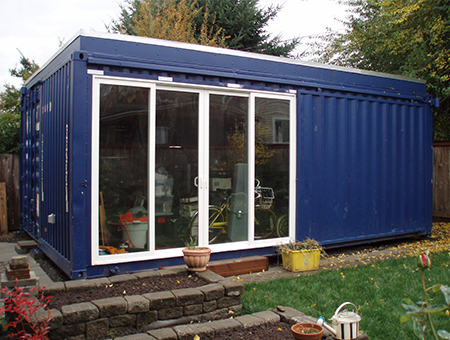 • The steel container conversion adds some costs, such as adding insulation, floors, doors, and windows. • Steel ISCs are very heavy. These issues are often surmountable, so long as the regional cost ratio remains favorable. 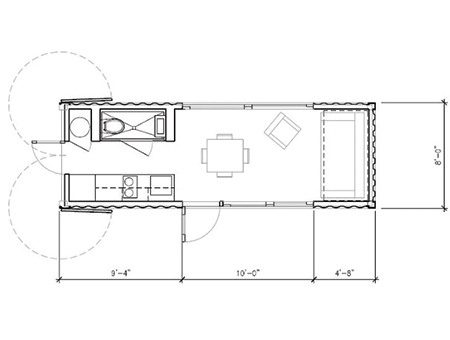 Why select Cargotecture for my micro-home, retreat, DADU, or home office? 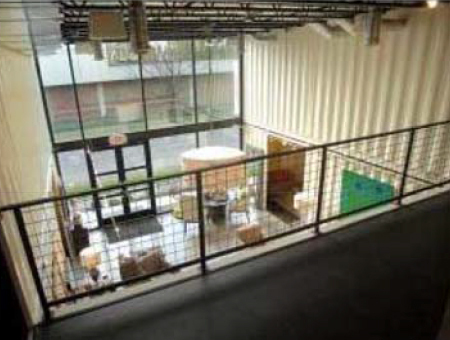 Cargotecture’s Principal Joel Egan has been a leader in the ISC-construction industry for over a decade, and this experience makes our designs a cut above in style, utility and sustainability. 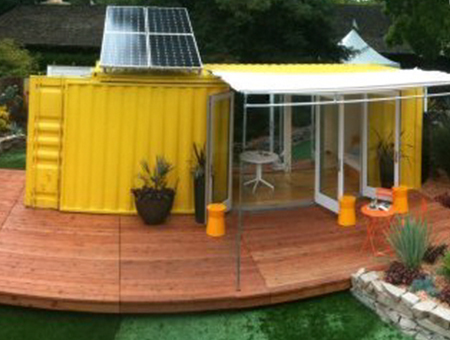 A Cargotecture home or office is sustainable, smart, modern, and durable enough to last several generations - not to mention just plain COOL! • They can be relocated (including their foundations), so they can be moved from season to season, turning from fish camp to surf shack. • They can be secured against intruders and storms. • They are nostalgic for their globetrotting history. • Architecture critics love them. • They travel easily on typical trucks, ships, and trains. • This is a unique luxury retreat that can be a transferrable asset for many generations. 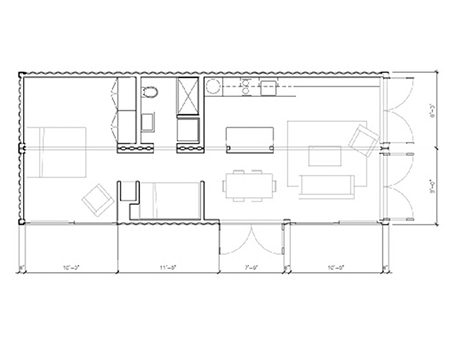 I am a do-it-yourself builder and would like to use your construction documents. Can you help me build my own? On a case-by-case basis, we provide contractual ISC construction consulting services. 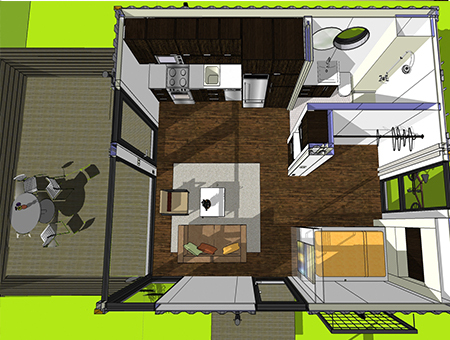 We have worked with engineers, architects, builders and do-it-yourselfers with great results. Please contact us to discuss our models, plans, and options. I live in an extremely hot and cold weather environment. Are your designs fully insulated? 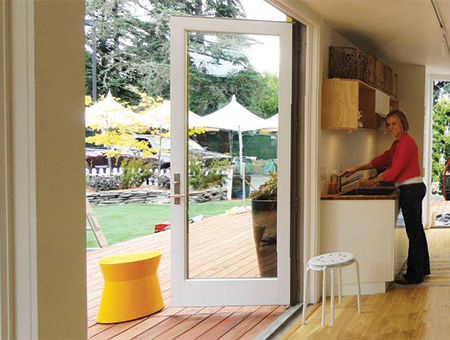 Would these homes be able to handle these extremes? Yes. 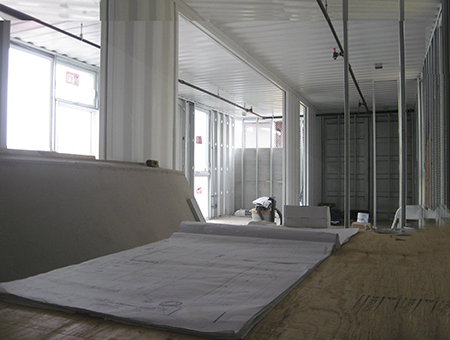 All our models are insulated about 15% above IBC and UBC building codes in the floors, walls and roofs. The building can be placed in cold, moderate and hot climates. The recycled plastic and soy sprayed-in insulation is more than sufficient for most climates — R24 walls, R 44 ceilings, and R32 floors. The roofs can handle 60psf snow loads. 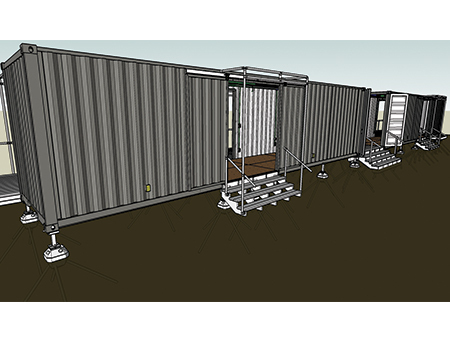 How much will shipping the Cargotecture from the factory cost? Shipping tends to be approximately $1.20 per mile per truck (up to 40’ on one truck). If you provide us with your Zip code and address we can offer an accurate delivery cost to your location. What kind of foundation is recommended? The foundation depends on the soil and terrain on which you will be placing your Cargotecture structure. Proper foundation configurations are important. Your local contractor/ engineer must approve them with your local planning/zoning/building department. Full detailed drawings will be available once your order has been initiated. 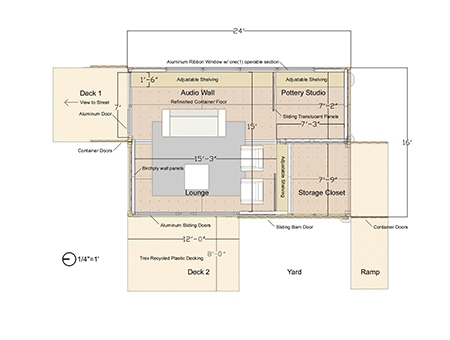 These drawings will assist your contractor in determining the right foundation for the terrain. Cargotecture recommends diamond-shaped pre-cast concrete/steel foundational piers (examples can be seen at www.pinfoundations.com). They are less expensive and more green than a site-poured slab and they have been approved in seismic, frost, flood, high wind zones as well as areas with poor soils. 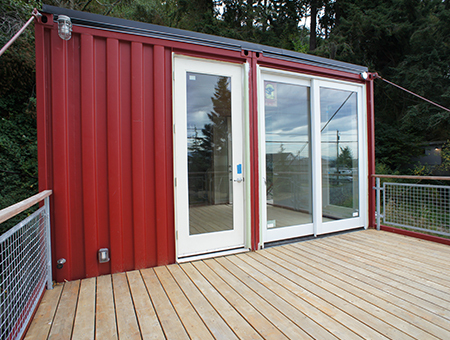 Cargotecture procures these with cargo container locking mechanisms already installed. 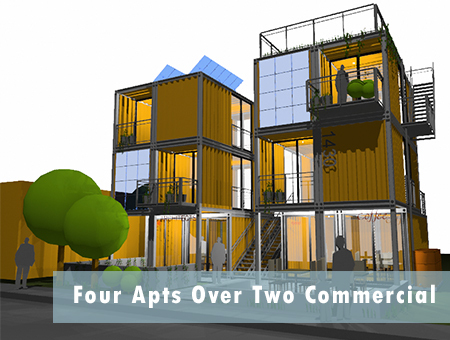 They come shipped with the unit at an average cost of $220 per block and most homes require a minimum of 6 blocks. If you are located in Washington State, our construction arm can build your foundation and set the home. If out of the area, we will assist you in selecting a contractor that can build your foundation and hook up your sewage and electrical systems. The final installation needs to meet local code requirements. 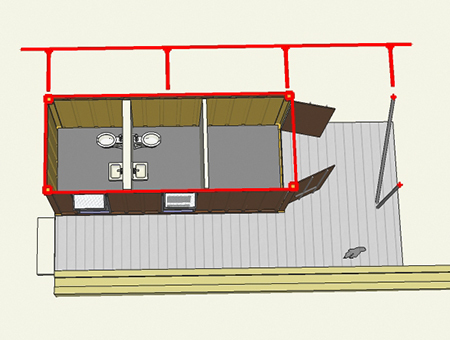 Do you have awnings for outdoor living, and decks to expand my livable space? Awnings are available as an option for passive heating and cooling. These are available in 15’x10’ sections. Decks are available in a 12 x 20 size, with customization additional. What additional options, such as roofs for green roof gardening, are available? Does the purchase price include all the electrical/water/washroom installations/connections? Yes! 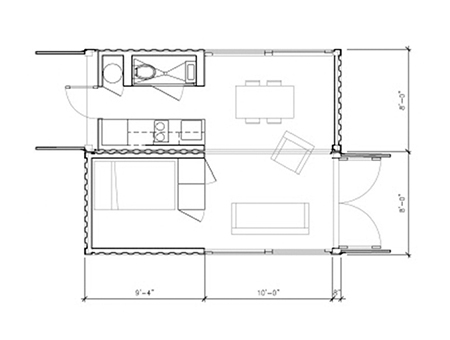 Our homes are shipped complete, including plumbing if your model has a kitchen or bath. 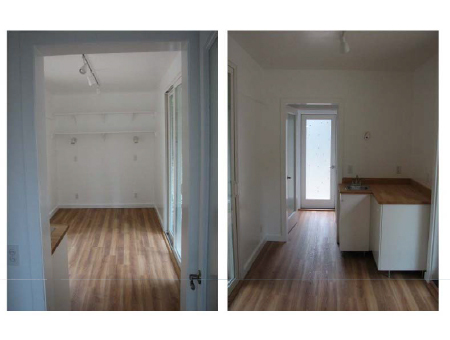 It is a complete inspection-approved move-in ready home, requiring only foundations and electrical/plumbing hookup. Permitting is also additional, but in many jurisdictions, if your project is less than 200sf there is no permitting process required. Are you in a position to build with my own designs? What is maximum size that you can do? We can do some minor customization. 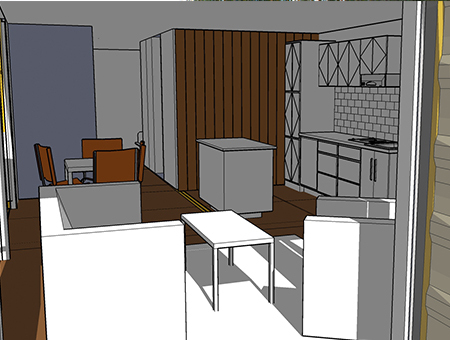 The cost will be quoted on a separate basis and it can increase the time to complete the drawings. Please see the "custom designs" tab on this website for more information. The following options are available for enhanced energy performance or to take your project “off-the-grid”. Pricing is available upon request. Natural gas or propane appliances, water heater and furnace. 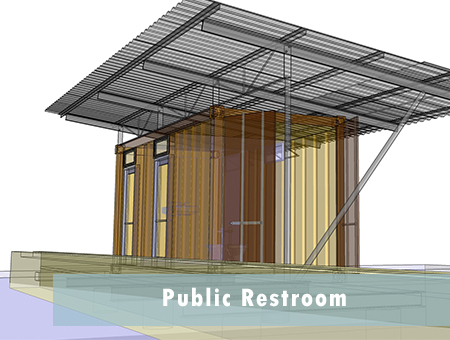 Composting toilets or “green machine” sewage treatment. 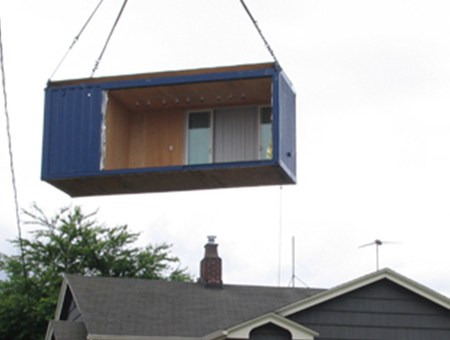 Cargotecture will research the specifics of your site to determine and assess the feasibility of transportation, crane access, local zoning codes, foundation required etc. These tasks are typically billed hourly and very rarely run over $1000. Your Cargotecture home is factory permitted, but typically local permits are required for land use review, foundation design, and utilities. 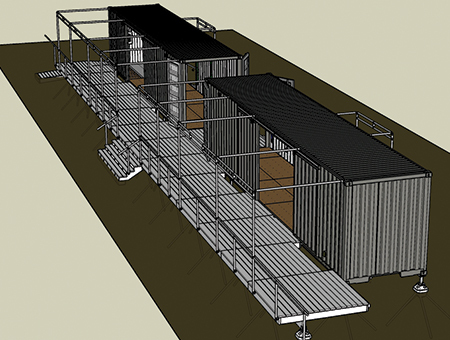 Cargotecture can assist you for a fee that typically ranges from $2000-$5000. Upon completion of design development, a non-refundable 50% is required to begin construction of the home at one of our factories. Production typically takes 30-60 days depending on options and complexity of your project. 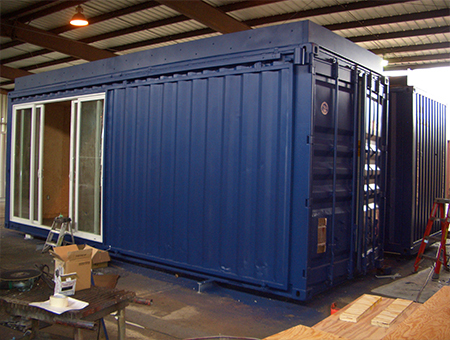 The balance of the sales price is due upon factory completion of your Cargotecture unit. 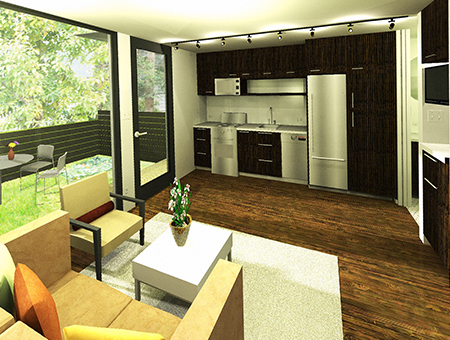 Then the home will be shipped to your site, and you will have key in the door within a week.